This is it, folks. The finale to the riveting saga where I just spout my opinions about the best qualities for each member in Aqours. You can lynch me now. 5. Kurosawa Ruby has a signature pose. Now I know what you’re thinking. Yoshiko Yohane and You also have signature poses so Kurosawa Ruby isn’t anything special. Yohane flashes the peace sign right by her eyes and You salutes like and smiles like she’s a drill sergeant who is about to tear into some new recruits at boot camp. But Kurosawa Ruby fully embraces her distinctive, particular manner of standing with her balled fists hovering near her chin. If Kurosawa Ruby is ever seen on-screen, her hands will probably be glued to her chinny chin chin. In fact, I bet she also assumes the position when she’s off-screen. Probably sleeps like that, too. If she ever gets into a scrap with Yoshiko to determine who gets to date Hanamaru, you can bet that Yoshiko will never be able to attack Kurosawa Ruby’s chin considering how closely Kurosawa Ruby guards the part of her face that is below her mouth but above her neck. Kurosawa Ruby will surely become a boxer with world-class defensive skills. 4. She is a shy, reserved girl. And so all the introverted and introspective viewers and fans flock to Kurosawa Ruby, their patron saint. Emotional resonance is a powerful thing. 3. She has twin tails / pigtails / side ponytails. Kurosawa Ruby valiantly wields the iconic hairstyle for moeblobs. By refusing to imitate her sister’s orthodox hairstyle, Kurosawa Ruby creates some distance between her and her illustrious family heritage and thus avoids some stress. But by doing so, she actually ends up following the tradition established by modern day anime moeblobs. Her hairstyle truly accentuates her girly side. 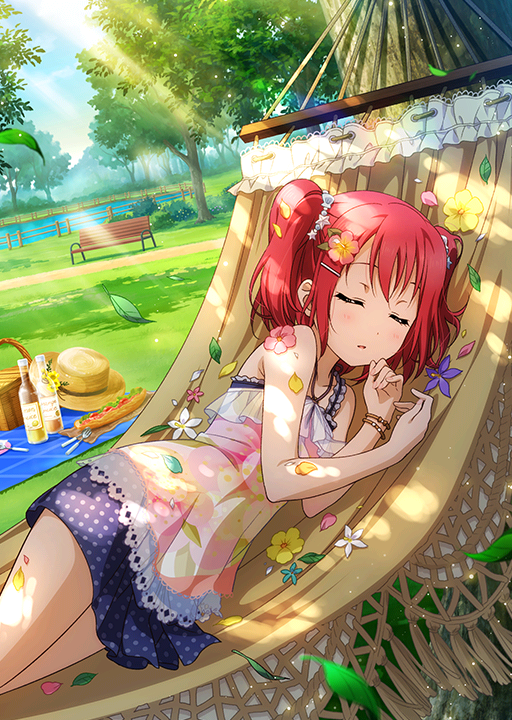 The other girls only wish they were as feminine as Kurosawa Ruby. But no one else even comes close. 2. Her lung capacity is out of this world. 1. She can take initiative (sometimes). This is probably the only completely serious reason on this entire list, frankly. How many qualifiers, adverbs and adjectives can I stuff into a single sentence? But it takes guts to stand up to Dia and announce that you want to be a school idol when Dia is intent on pretending to fervently despise school idols. It takes courage to eat Yohane’s sketchy cooking. Do you remember how she grabbed Leah by the hand and led the way, which also allowed her to show Leah who wears the pants in their relationship? Can confirm that yes, she does sleep like that – or about as close as she can get to it when she’s completely limp. That’s official artwork from one of the LLSIF cards, so it’s canon. Anyway, good reasons! I LOL’ed at #2. One other thing I like about her is that she seems to be really good at picking up on other people’s feelings. Besides the business with Leah, I remember back in season 1 when she helped Chika bridge the gap with Dia, and part of that included knowing when to tell Chika it was time to back off and leave Dia alone for a while. Haha, then it must be true. Oh, glad to hear I could make you laugh! Oh, that is also a pretty amazing reason to like her. I’m sad I missed that. Ruby is great! I had no intention of watching the series and i still really don’t, but I really enjoyed reading about the girls. I was actually a bit disappointed when i got on WordPress the other day and saw you hadn’t written the next one yet. Can’t wait to see what you do next. Ah, I’m actually very glad to hear that you enjoyed reading about the girls despite never watching the series. That’s really encouraging. Thank you. Sorry to keep you waiting! And thank you. I’ll have to think about this, haha. I skip to the comment section. Haha, thanks. But seriously, I think Yoshiko would be toast. Congrats on finishing this segment!! Such a fun one to read about, and you did a great job discussing about each Aqours girl, I’d say. Thank you! It was rough yet rewarding work. I look forward to seeing you talk about the μ’s girls in 2018! Next Next post: The Best New Years Parties Start on the 29th!